A truly healthy lifestyle involves many different components, from staying on top of well visits and your medical needs to eating right and exercising and everything in between. For many outside of the medical field, that checklist may seem overwhelming, especially when it means darting from one doctor’s office to the next, making appointments, hunting down referrals and sticking to a hectic schedule in the process. The father and son duo behind Voorhees Medical Home understand how tough that can be, which is why they committed their practice to becoming a single stop for their patients. The Voorhees Medical Home is a revolutionary medical facility that provides traditional medical care for adults and children alongside a full-service medical spa and a nutritional and healthy lifestyle specialist. With that in mind the office Drs. J & M Healthy Lifestyle was born, a multidisciplinary approach to health and wellness. Combining the traditional medical office visit alongside a full-time nutritionist, who works with patients to understand nutrition while also crafting a customized lifestyle plan to fit patients’ needs. The location also houses The Garden Medical Spa, a fully loaded suite featuring top-of-the-line skincare treatments for all ages. From microneedling scar removal and HydraFacial MD treatments for teenagers and adults with acne, to beautifying options like IPL laser therapy for hair removal and rosacea treatment, Botox, chemical peels and more, patients can relax knowing they are being treated by specialized, trained aestheticians and medical professionals. 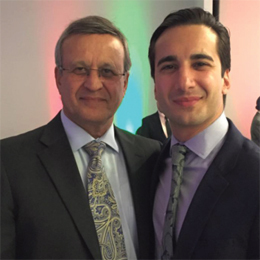 Dr. Mirmanesh is excited for the future of The Garden Med Spa, as his youngest brother Dr. Michael D. Mirmanesh, prepares to finish his plastic surgery training at University of California, Davis. “He will be joining us on the East Coast soon and we will have so many more resources for our patients,” says Dr. Mirmanesh. “We have been working with skin conditions for quite some time, so we created the medical spa to help people with their beauty needs while also helping our patients looking for more specific medical attention. The result? Quicker appointment times, less stress for patients and a close relationship that both patients and doctors can appreciate.